(June 2015) Thanks to a new ruling in the state of Indiana, Hoosiers will now get to experience the telemedicine trend. Just recently, the Medical Licensing Board of Indiana launched a pilot program to test the effectiveness and integrity of telemedicine. 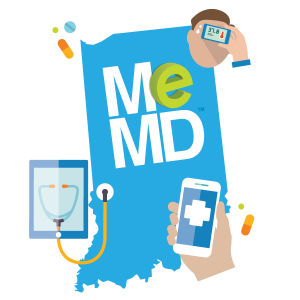 Dr. Nicholas Lorenzo, Chief Medical Officer for MeMD, presented the telemedicine provider’s services at a recent Indiana medical board meeting, leading the board to approve MeMD’s participation in this cutting-edge pilot program. • Telehealth consultations are required to include a documented patient evaluation summarizing the visit and the diagnosis. • The evaluation may be forwarded to the patient’s care providers to encourage continuity of care. • The evaluation must include methods or tools the physician used to assist in the initial history and physical exam. Selected as a telemedicine provider for the state of Indiana, MeMD meets all these requirements and has the nation’s most comprehensive network of care providers covering all 50 states – in most cases 24 hours a day, seven days a week. U.S. licensed and board-certified medical providers see patients online through MeMD’s secure, HIPAA compliant web service. If necessary, medications can also be prescribed online. Of those who had used telemedicine services in the past, 21 percent cited not having to travel for care as the biggest advantage. Twenty-one percent said the greatest benefit was that the quality of care was equal to or better than an office visit. Leading telehealth service provider MeMD is headquartered in Scottsdale, Arizona. MeMD is revolutionizing the healthcare industry by offering access to affordable, convenient, and secure web-based healthcare nationwide. MeMD combines proven telemedicine technologies with business model innovations to improve access to medical providers, reduce healthcare costs, and make the experience of seeing a physician convenient, enjoyable, and affordable – the way it should be. For more information visit www.MeMD.me.